The App allows your child to find a suitable Tempo from a wide selection and to adjust both the number of beats per Minute and the number of beats per minute. 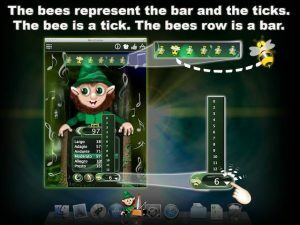 Your child will quickly develop the sense of rhythm playing with the app. Metronome app provides both visual and audio effects. The eyes of the dwarf move accurately in time and a flying bee lands on dwarfs nose every Time at the last part of the clock. The number of bees, over the dwarf’s head, represents the stroke, and the individual bees are parts of the stroke. The bee with open wings represents the current clock-part. You can also use the Visual and Audio effects separately from each other. So for example, it is possible by clicking on the button, with the eye to stop the animations, in this case the dwarf will close his eyes. If you click on the button with earplugs, the Audio in the App is muted and the dwarf is standing with the closed ears, you can, if you want, reactivate the visual effects. Our experience and Tests have shown that the children enjoy playing music with the MetroGnome. Bee-shaped beats and the measures that sound like a crystal bell with outstanding sound quality.